Tribute Homes’ next floor plan focus, The Blake II—starting from just $208,400—features two bedrooms, two baths, and 1,780 square feet of thoughtfully designed living space. This incredible home is perfect for retirement and featured in some of the most exciting active adult living communities in Charlotte and Coastal North Carolina. This thoughtful floor plan greets guests and neighbors with a charming covered front porch, perfect for drinking sweet tea beneath while waving to passersby. Inside this darling Tribute home, you’ll find even more of what you’re looking for in an active adult living home: a study and just-right-sized great room greet guests as they enter the front door—an optional bar in the great room serves as a wonderful gathering place for friends and neighbors alike. Beyond the great room, you’ll find the dining area and kitchen with optional island. This is where many a holiday and family gathering will take place, home-cooked meals enjoyed by one and all. The two-car garage, with options to extend up to six feet, is located in the back corner of the residence. A second bedroom and powder room are perfect for when friends or family come to visit, while the well-appointed master bedroom and bathroom in the front corner of the home provides a welcome respite after a day of experiencing all the Carolinas have to offer. There are even a number of upgrades available to make the master suite a haven all your own. You can build this incredible home at the active adult living community of Edgewater On Your Lot in Lancaster, South Carolina, from $208,400, Here you can explore 3,200 miles of frontage at Fishing Creek Lake, spend time at the Edgewater Golf Club, set sail from the Edgewater marina, and explore many shops and restaurants. How many active adult communities in Coastal NC can offer that? Only Edgewater. You can also find The Blake II at Parkway Crossing at Brunswick Forest starting from $268,000. Among the many reasons Brunswick Forest residents love their lifestyle is they don’t have to leave the community to play golf or tennis, stop by the grocery store, get in a workout, see a doctor, or get out on the water. Everything you need is close by! Tribute Homes builds active adult living homes in some of Coastal NC’s best retirement living communities, like the two listed above. The best part? They all adhere to the Tribute Homes promise of offering quality homes at unbeatable Carolina value. If you’re not sure which Tribute Homes community is best for you, take a trip on the Tribute Trail to experience more of the homes and neighborhoods you can find us in. 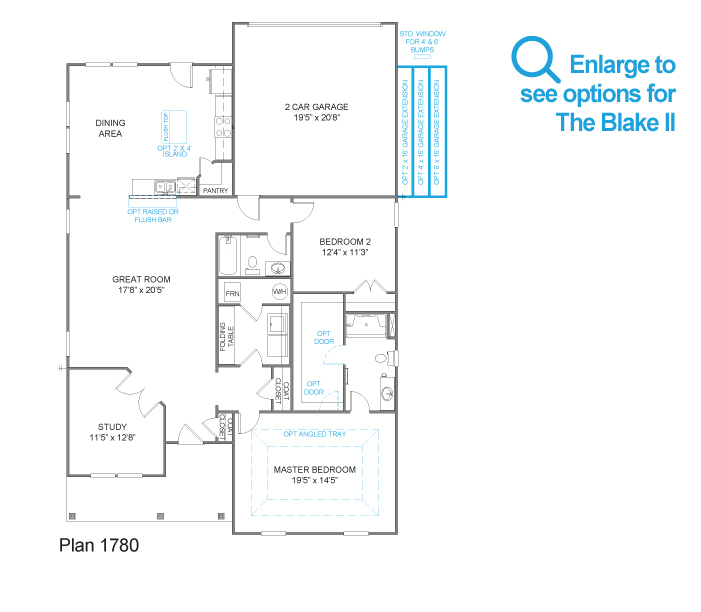 Discover more about why The Blake II is the perfect active adult living home for you. Contact Tribute Homes today to learn more.